Charmed or cursed? Doomed by their royal birthright and their parents' marital misery? Or destined to live out the best of their late mother's legacy by selflessly involving themselves in real-world problems? Only time can tell how Prince William and his brother, Harry, will play the extraordinary hands that fate has dealt them. Meanwhile, "the heir and the spare" remain the focus of merciless media attention and the source of endless speculation by royal watchers worldwide. 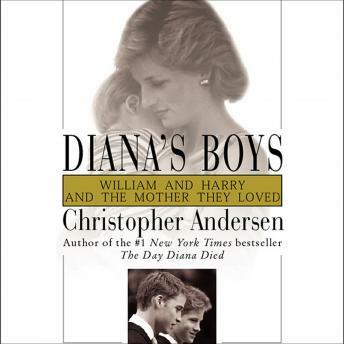 Since Christopher Anderson meticulously investigated the horrific accident that killed Princess Diana and divulged his findings in The Day Diana Died, he has concentrated on her two engaging young sons. Based on interviews with numerous informed sources close to the boys, their father, Prince Charles, and their paternal grandparents, Queen Elizabeth and Prince Philip, Andersen's latest abounds in startling revelations. He describes, for example, how Wills and Harry were caught in the crossfire of their volatile parents' ill-starred marriage and how Charles, devastated by his former wife's death, has attempted to cope as the single father of two strong-willed teenagers. His account of the initial, and understandably awkward, meeting between the young men and Camilla Parker Bowles, Charles's longtime mistress, is especially striking. Great book . Enjoyed listening . Gave more information on Princess Diana and the love for her boys. I cried and realized the pain she went though. I pray that she has found her peace. And will someday see her boys again.